The following guide to Stellaris contains some useful tips and tricks on the subject of resources, constructions, fight and research. At the end of our Beginner's Guide concludes with other general tips. 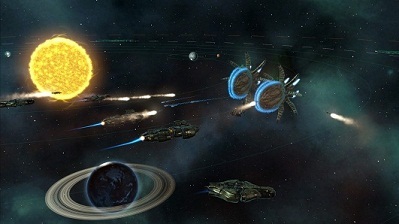 In strategy games, resources are always an important issue and so it is also with Stellaris. In our guide, we give you some useful tips that should help you to improve your gameplay. - Especially at the beginning of Stellaris it is important to collect energy credits and minerals, because you will need them for construction projects. - How many credits or money and minerals you have, you can see them on the top. You can see credits on the yellow lightning symbol circled and minerals on the red diamond. - Resources you can only produce in the fields, in which a resident is. These you can put however, to produce the resource you need. - Message resource carefully, because this is often quite limited. Use them only if you can derive substantial profits. Not only resources but also construction projects play an essential role in Stellaris. The selection of construction options is large, which is why we have some tips for building, that you should not be ignored at the beginning of the game. - Have you gone through the improvements available for your buildings? You can find it on the upper right corner of the field, a yellow triangle with an arrow pointing up, you can click on it and thus learn what improvements are available to choose from. - Built an outpost outside your area so that you can explore external planet. For this you need a construction ship. Bear in mind, however, that your monthly pay for Outpost with influence. Make sure you get in this way always rich star systems, so that your opponent cannot settle there. - Sometime you no longer you need the outpost, then you can remove it in order to save the cost. - Build your spaceport. Thereby you can, for example, increase food production and the production of credits. - If Stellaris still a bit overwhelmed at the beginning, you can at least start with the ship upgrades, AI left. Click to Automatic Finish, your ships are quickly improved. - Only on the research of a weapon, because maybe you will meet an opponent who has his defense properly aligned to this. - At the beginning of Stellaris, the fight is not the highest priority. However, you should build a small yet defense while you mainly focused on the economic progress. Another key feature of many strategy games is the research. This you should not neglect in any case, and especially at the beginning of Stellaris. - Once it is possible build another research vessel and bring another researcher. In this way you can explore areas faster and detect potential enemies and resources. - You cannot immediately communicate with a newly discovered genus. First you need the information, explore the discovered species. - One of the most important tips in our Beginner's Guide to Stellaris is that you should always make sure whether the next one researcher turns up a symbol. This is a sign that you save a lot of time with a research project. - Increase research capabilities of your scientists, by starting research projects Scientific Method and physics engineering laboratory. Here, we have summarized some general tips that provide you with additional information to get you started. - Established as many planets as possible and will seek to ensure that you keep the negative impact low. However, you should find a holy world, this not settled as long as you are not strong enough. - You will not take any planet individually in the research, so you can easily select explore system command by right-clicking. - Block Fields recognizes on yellow and black or red and black markings. These have to delete and for it you need to spend a few credits and minerals. - If your starting system is not particularly rich in resources, then build your research vessels to explore systems nearby. - Stay tuned to the notifications on top of the screen. You should read them regularly and don’t miss important events. - Don’t ignoring the information fields on the right bottom of the screen because they give you useful information. Here you can learn, for example, what resources can still degrade.